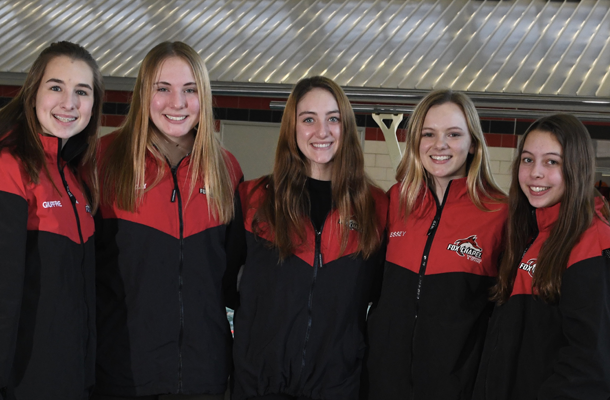 Vernon Yenick has coached the Fox Chapel Area diving teams since 2007, but this is the first time the girls’ team has been this large and filled with so much promise. The members of the 2018-2019 team are senior Kate Eames, sophomores Zoe Boychuk and Maggie Kelly, and freshmen Hanna Essey, Sarah Guiffre, and Claire Hamilton. “There are strengths in all of the girls, so I can rotate them in meets and still be confident we’re going to win,” says Coach Yenick. WPIAL regulations only allow three girl and three boy divers to compete at meets. During her four years with the team, senior captain Kate Eames has advanced to the WPIAL Class AAA diving championships twice – with a third surely to come this season –and is encouraged by the influx of new girls. A lot of that spirit starts with Kate, who enjoys teaching the younger girls on the team as well as the ones who participate in her coach’s diving clinics. “Kate is fun and very upbeat and is a team leader in the sense that she can motivate kids to try new things that they might be afraid of doing,” says Coach Yenick. Sophomore Maggie Kelly, a six-year gymnast who joined the team as a freshman, has been a beneficiary of Kate’s nurturing. She only began to dive about one and a half years ago, primarily because of her mother’s suggestion when Maggie expressed an interest in trying something new. “Diving is really similar to gymnastics, so I’ve been able to pick up skills really easy,” Maggie explains. Right now, she’s working on her technique and adding more dives to her repertoire, including a reverse dive. 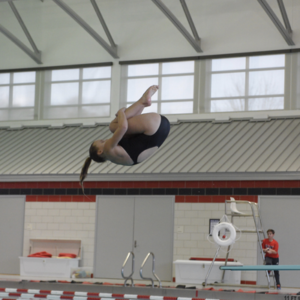 Hanna Essey, one of three freshmen who joined the team this season, has already impressed her coach with her athleticism by quickly learning all of her dives. She has found that the vault event in gymnastics has been a big help to her because it requires great strength and getting high in the air to mount and dismount. The fact that she’s open to trying new things also has worked to her benefit. 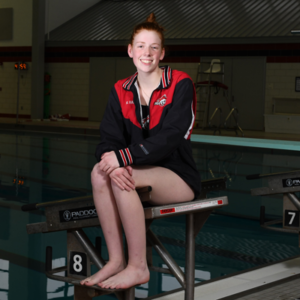 Kate says what she will remember most about her years on the team are her fellow divers – the boys’ and girls’ teams are very close – and the things she’s learned from her coach.